The party that won the South Goa Lok Sabha seat in 2009, 2014 won India’s LS Elections. Who will win from this district in 2019? t promises to be no cakewalk for the sitting South Goa BJP MP Narendra Sawaikar this Lok Sabha election. However the question remains if Congress can take the advantage or not. With Aam Admi Party (AAP) staged to play a big role in Salcete, South Goa is the focal point for Goas' LS MP election 2019. Political pundits also feel that given that this is the General Parliamentary elections, there it is less likely for the South Goa voting to be only on local issues and that the advantages/disadvantages of the party, their candidates and its overall perception will hold the key in deciding the winner. It will also boil down to which party can get a sizeable lead in each of the assembly constituencies, talukas as that will be the make or break factor in the numbers game. In the last election in 2014, a sizeable amount of divided votes along with the BJP/Modi wave had allowed the BJP to cruise to victory, a feat they had achieved after a long time. But coming to 2019, the scenario has changed and the challenges BJP faces have increased in the form of a united Congress and not as much of division of votes as was the case in the last elections. For Congress, there has been some criticism among the youngsters and middle-aged section over the choice of candidate in Francisco Sardinha as they felt the party could have gone for someone who was more young and dynamic. However, at the same time, another section feels the party was right in going for someone with experience and that the anti –incumbency factor will work for Congress nonetheless. On the other hand, AAP has promised to emulate the government led by Arvind Kejriwal in Delhi but will be hoping to improve from their previous runs at the earlier Lok Sabha and State assembly elections. At the constituency level, South Goa has 20 constituencies spread across several talukas. Salcete Taluka in South Goa has 8 constituencies making it the decisive factor in the election of Lok Sabha 2019. In 2014 only Curtorim, Margao and Fatorda had non-BJP MLA's with the Curtorim MLA Aleixo Reginaldo Lourenco being the candidate of Congress for south Goa. The constituencies of Nuvem, Benaulim, Navelim, Cuncolim and Velim had BJP or BJP supported independent MLA's. Though the BJP did not get any big leads in any of the Salcete constituencies, BJP supported MLAs had campaigned for the BJP throughout Salcete. With no wave of BJP this time around these constituencies of Salcete taluka will be a tough nut for BJP to crack and make it easier targets for Congress. It remains to be seen however if AAP can hold their sway in Salcete, a taluka they are placing a lot of emphasis on Salcete and the only taluka where they performed well in the last elections. Former Benaulim Sarpanch Royla Fernandes who was AAP Benaulim candidate was the only one to save the deposit of AAP in Goa in 2017 assembly elections. South Goa candidate Elvis Gomes has in his corner meetings has promised to be with the poor and the lower middle class to improve their living and has got a good reception so far. South Goa had in the last election recorded a voting number of 4 lakh 10 thousand. Out of these at least 1 lakh 60 thousand voters were of the Salcete. 83 thousand 928 voters favoured the Congress candidate Aleixo Reginaldo Lourenco while atleast 76 thousand voted for others which include Churchill Alemao and Swati Kerkar to some extent. The altar boys of (late) former Chief Minister Manohar Parrikar managed to draw atleast 21 thousand votes for the BJP out of the total votes. With no altar boys for the BJP in Salcete anymore and Congress now having 6 out 8 MLA's in Salcete the loss of these pockets is a foregone conclusion for BJP, which is evident in their public and booth level meetings list wherein Benaulim, Velim, Navelim, Curtorim are hardly visible. Clearly the Congress is at advantage in Salcete. Though Salcete hopes for BJP are negligible this time, light can be seen at the end of the tunnel for BJP as their entire efforts are being put in Ponda, Marcaim, Priol, Quepem Sanguem, Savordem while Fatorda, Margao constituencies of Salcette may still offer some hope. While Fatorda has Goa Forward Party which is backing BJP, in Margao, even though there has been Congress MLA Digambar Kamat, BJP has always got a lead in Margao for Loksabha elections. In 2014 the BJP got 10 thousand 198 votes as compared to Congress which was 9 thousand 70 votes. Even Fatorda votes for both the major candidates were at par. With Congress, issues over the choice of candidate aside, pundits believe that Salcete this time will vote to look at the central picture and may not bother so much about the local picture. Deputy Chief Minister Vijai Sardesai while commenting on his role in these LS 2019 Elections said "BJP has a big cadre and has its strong roots in Fatorda too. It was their bastion in the past." While Churchill Alemao of NCP Benaulim said "The NCP has not yet given any signal for campaigns so we will decide subsequently." 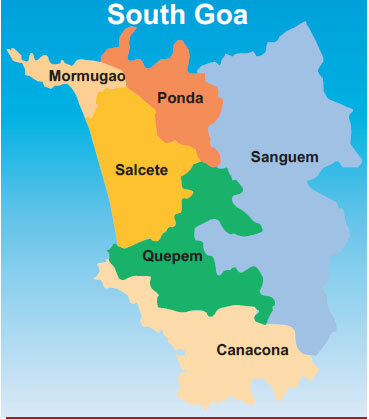 Moving further south, Sanguem, Savordem, Canacona have always considered to be BJP bastions and the same was proven in the last Loksabha elections. While Sanguem had a BJP MLA for 18 years in a row; however, in the 2017 elections, for the first time, a non-BJP independent MLA belonging to the Scheduled Tribes got elected. The scheduled Tribes in Sanguem are over 9 thousand in number and are an important factor. The MLA Prasad Gaonkar had supported the BJP Government during its formation but has been vocally criticising them for various reasons. The MLA has also quit the Forest Development Corporation Chairmanship as a mark of protest. He wasn't seen with the BJP South Goa candidate while Adv Narendra Sawaikar filed nomination nor he has spoken of his support. Looking at this stand of the MLA the BJP has handed the charge of Sanguem to the former MLA Subhash Faldessai. Will the angered separated MLA swing votes otherwise and benefit the Congress in Sanguem is what the people observing the election are pondering upon. Sanguem has a sizable number of people who were dependant on mining related busines. The despair against the continued promises of BJP without results has echoed till Delhi. Congress, however, has been making a bouquet of promises on mining but hasn't come out with any concrete statement on how it plans to do so. Not to forget that Ramesh Tawadkar who was a former Canacona MLA of BJP and had separated from BJP after the 2017 election for denial of the BJP ticket has joined hands with BJP back again. Ramesh is going to benefit the BJP in holding on to the Scheduled Tribal vote banks is not just Canacona but also in Sanguem and Quepem too. Looking at Quepem, it is important to mention that this Congress has been ruling the constituency for the last 20 years with Chandrakant alias Babu Kavlekar as the MLA. But surprisingly the Quepem has rarely given a lead to Congress in the past Lok Sabha Elections. Though the majority is not that big, it is noteworthy that the BJP and Congress are neck and neck in Quepem always when it comes to the LS elections, while Babu usually leads with a big majority for the assembly elections. Babu Kavlekar, however, has a task at hand to get back the lead of Congress in Quepem. The Ramesh Tawadkar factor along with the Prakash Shankar Velip factor in Khol, Barcem, Morpirla, Balli and Fatorpa factor has been working for the BJP for quite some time now but the thrust will be placed on improving the performance to fill in for the lost pockets. However yet again the mining factor makes it difficult for the BJP to face the people but they have managed to convince the people here that only they will be able to solve it. The Congress, however, has the Babu Kavlekar advantage here and is working out for them. Sardinha has received a good response here in Quepem urban areas as he campaigns here. Curchorem has been a cakewalk for BJP with Nilesh Cabral as their soldier there. Mining issue too seems to have not changed the minds of people here as they elected the MLA Nilesh with over 8 thousand votes lead. One of the reasons is a weak booth level unity. While Sardinha went to campaign on Monday Congress workers had arguments and angered moments. Same is the case with Sanvordem. The Congress lies divided and the BJP has got strengthened with the entry of Deepak Pauskar, the erstwhile MGP MLA and now BJP MLA. However, with MGP supporting Congress for the Lok Sabha elections, it comes as a big boost for South Goa and if MGP had gone ahead with its plans to field a candidate for the LS South Goa seat, it was speculated that they would have split the BJP votes in the parliamentary constituency. While the tables have turned for the MGP and Congress; the tables have also turned for Congress as Independent MLA Govind who had campaigned for Congress in South Goa and pulled in a sizeable number of votes, is now campaigning for the BJP and it remains to be seen how much Congress and BJP will benefit from support from MGP and Gaude, respectively. While Sardinha has already started campaigning in Ponda where their numbers have increased on the ground level, BJP was more successful in the 2014 LS elections from this area. Canacona has always been giving a great back up to the BJP for Lok Sabha elections. The entry of the Ramesh Tawadkar and making him Vice President of the BJP is going to help the BJP a lot in Canacona as he has proven his mettle in the last assembly election by contesting independent and bringing down BJP. Once a critique of BJP Ramesh is now actively campaigning in Canacona and is bound to give rich dividends to BJP there. Moreover, in Shiroda, the only Assembly seat from the South that is going for a by-poll, AAP, BJP, Congress have all fielded candidates, Congress, AAP and MGP are all camapaigning against the BJP while BJP got a boost with the former MLA Subhash Shirodkar on its side. Elsewhere, with the Cortalim, Dabolim, Mormugao and Vasco MLAs all from BJP, it remains to be seen how much of an impact Congress can have and how much of an impact, issues like the CRZ notification, anti-coal hub, and ramponnkar issues, that Congress has vowed to work against, will have in these areas. Overall, notwithstanding AAP refuting this argument, pundits feel that if AAP increases their vote share in South Goa in this election, it would adversely affect Congress as the anti-BJP vote will be split and BJP stands to benefit in the long run when it comes to the numbers game alone.